It’s that time of year again! 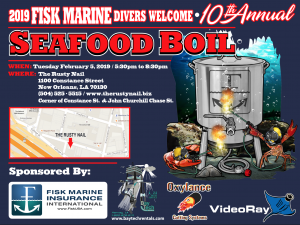 If you are in New Orleans for Underwater Intervention 2019 please join us Tuesday, February 5th, for the annual seafood boil at The Rusty Nail. The Rusty Nail is located at 1100 Constance Street. The seafood boil is from 5:30pm to 8:30pm. All are welcomed.